I love this photo taken by my friend John Alexander. 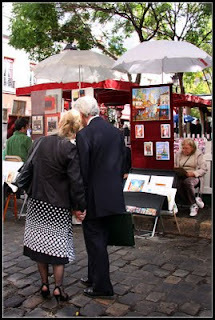 He found this well-dressed older couple at an outdoor market in Paris. They're so elegant and affectionate. Notice how they're holding hands. And oh her shoes! Oooh la la! Very romantic! Wonder whether they have been happily married for years? I love these types of photos - my husband and I always smile when we see couples like this on the street. Yes, it gives me hope for the future of my marriage...especially now that the grey hairs are coming in!